Quick-cooking lentils are probably the oldest cultivated legumes and are certainly among the earliest cultivated plants. Often planted alongside wild wheat and barley by our ancestors, lentils are both highly nutritious and good-tasting. Lentils are generally split into two broad groups: flat, large lentils and small, rounded lentils. While the large varieties are generally more common, it’s the small, varieties that are more prized. Small lentils tend to keep their shape better and have a finer, creamier texture than their larger cousins. Their taste is somewhat nutty with the pleasantly familiar legume flavor typical of lentils. Among these small lentils are black lentils, sometimes called “beluga” lentils for their resemblance to beluga caviar. 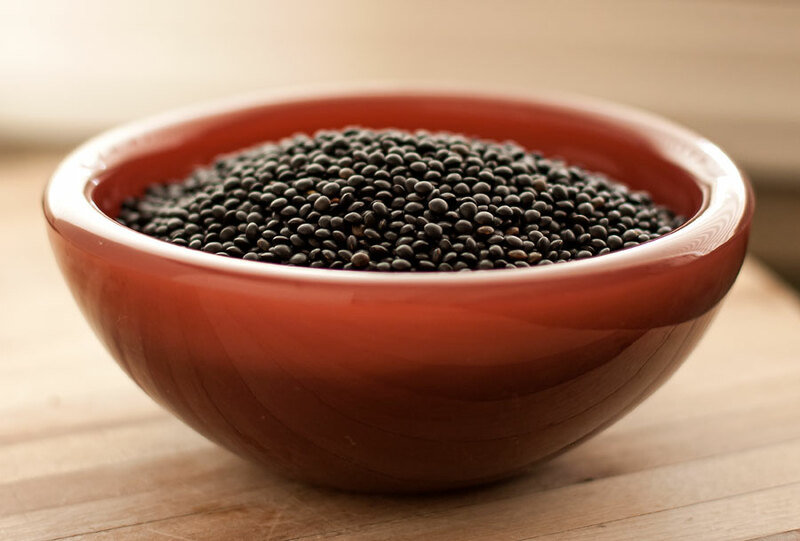 When cooked, black lentils lose their ebony color and become a rich mahogany brown. Black lentils go well with other robust, earthy flavors. 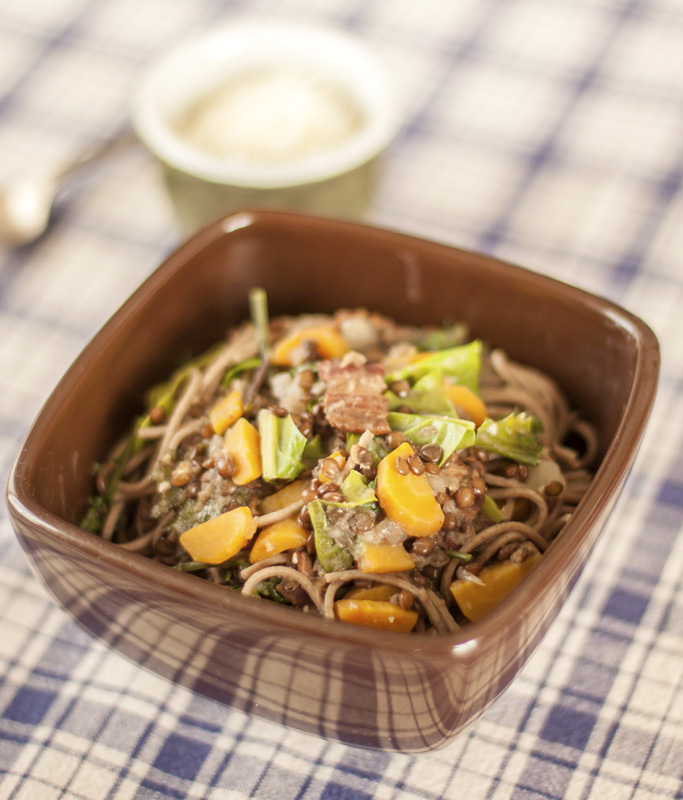 In this East-meets-West recipe, lentils are teamed up with soba, the buckwheat noodles that are a staple in Japan. 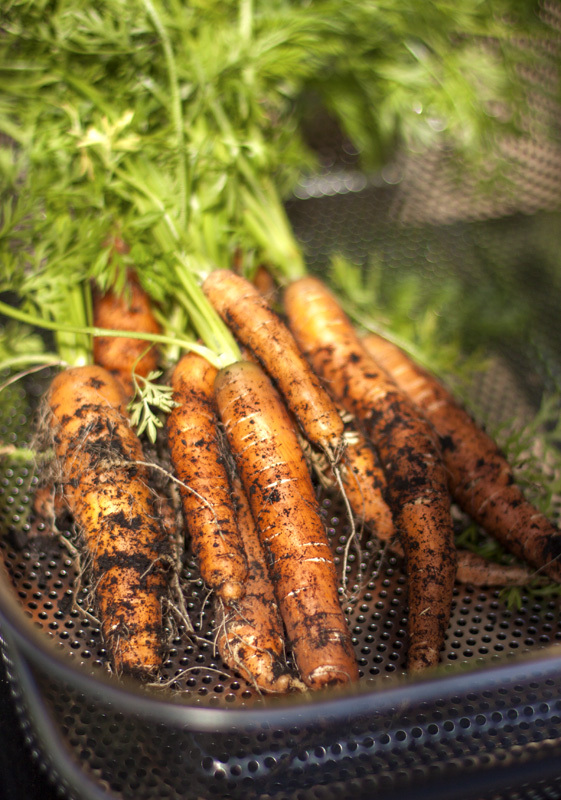 We love the way sweet, freshly harvested carrots and smoked bacon add their own magic to this dish. 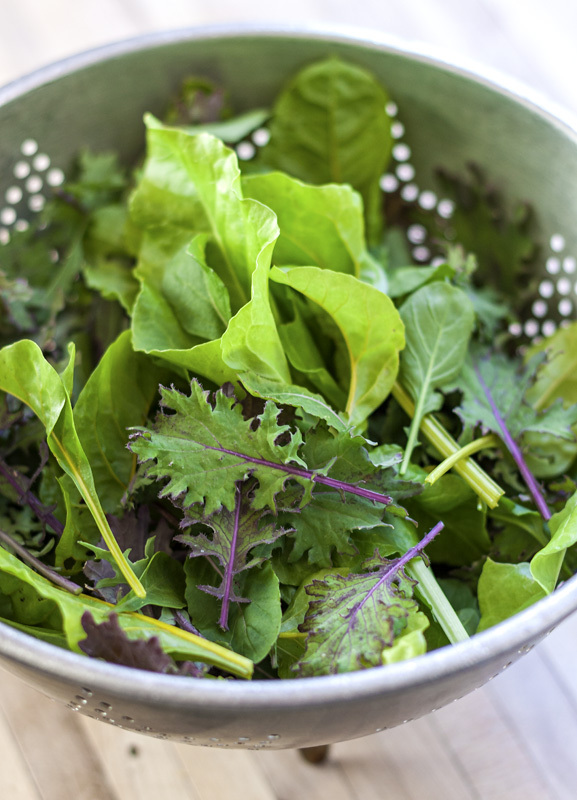 A blend of barely-wilted garden greens, including kale, arugula and chard add a refreshing note. We’ve enjoyed this dish both hot and cold, so make plenty so you’ll have leftovers. Omit the bacon and you’ve got a vegetarian dish that even meat-lovers will appreciate. With soul-satisfying hearty flavor and pleasingly firm, but tender textures, this dish is truly an earthy delight. Brown the bacon or pancetta in 2 tablespoons olive oil until lightly browned, 3 to 5 minutes. Add the onion and carrots and cook until the vegetables are softened, about 5 to 7 minutes. Stir in the garlic and cook until fragrant, about 30 seconds. Add the lentils, water and broth, cover and simmer until the lentils are fully cooked and tender, 40 to 50 minutes. Uncover and stir in the porcini elixir. Simmer for 2 minutes, then add the greens, stirring them in a handful at a time, and cook until completely wilted, about 5 – 8 minutes. Meanwhile, bring a pot of water to the boil and add the soba noodles. Reduce heat to a low boil and cook for 5-6 minutes or until the noodles are cooked through, but still slightly al dente in texture. Drain and rinse with cold water. Drain again. Toss the soba noodles with the remaining 2 tablespoons olive oil. 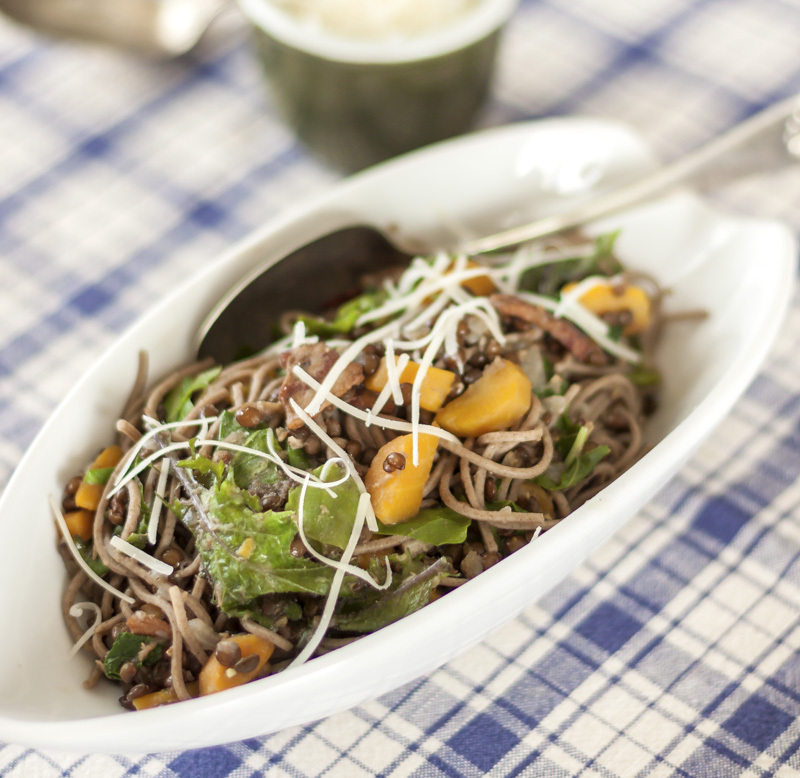 Gently toss together the lentil mixture with the soba noodles. Season with salt and pepper. Serve with plenty of grated Parmesan cheese on the side.